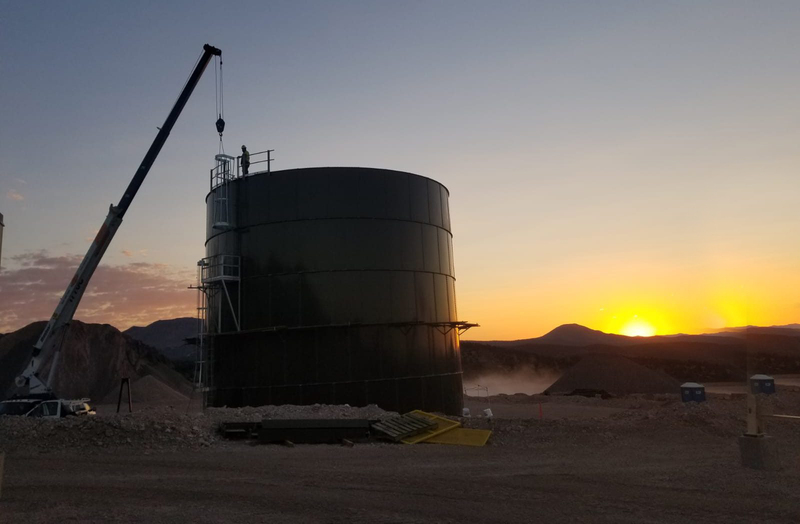 News - Page 2 of 5 - Superior Tank Co., Inc.
For over 30 years, Superior Tank Co., Inc. (STCI) has designed, manufactured, installed and serviced bolted tanks and welded tanks for oil storage. STCI is one of the only bolted steel manufacturers which can proudly display the prestigious American Petroleum Institute (API) SPEC 12B monogram on our bolted tanks for oil storage. In order for a bolted tank to include the API 12B monogram, the storage tank must strictly adhere to the API SPEC 12B standards. In addition, the tank manufacturer must be recertified on an annual basis to meet the strict API SPEC Q1/ISO 9001:2008 quality standards. What makes a bolted tank “Superior”? Various companies sell bolted steel tanks, but there is only one “Superior Tank”. Is there really a difference between bolted tanks manufactured by Superior Tank Co., Inc. (STCI) and bolted steel tanks and glass-lined bolted steel tanks made by other companies? The answer is in short “yes” for various reasons including STCI’s precise manufacturing processes, premium raw materials, extensive company history, API SPEC Q1 / ISO 9001:2008 certification and outstanding customer service. Superior Tank Co., Inc. is one of the few bolted tank manufacturers in the United States and the only bolted tank company with manufacturing facilities in both California and Texas. Owning and operating State-of-the-Art manufacturing facilities gives STCI complete control of the quality of our bolted tanks and we are not reliant on outside companies for the quality of our bolted steel storage tanks. All of our bolted tanks use quality materials such as heavy duty Grade 5 or Grade 8 high tensile strength bolts and the steel used for our bolted tanks is verified to meet specific quality standards such as surface quality, edge quality, silicone content, squaredness and flatness. In addition, our specially formulated powder coating and corrosion preventing SiZr seal maximize the lifespan of the epoxy coating of the bolted tank. Our heavy duty gaskets ensure our bolted tanks remain in service and do not require storage tanks to be taken offline to replace the mastic which is used with glass-fused-to-steel bolted tanks. We have invested heavily in precision equipment such as CNC machinery, Automated Robotic Technology (ART), and advanced turret punches to ensure our bolted steel tanks are manufactured with exacting precision. As our bolted steel tanks are crafted with such accuracy, components fit together perfectly, eliminating tank leaks and field rework. To confirm our bolted tanks meet or exceed quality standards, STCI has implemented various Quality Management Systems and is API SPEC Q1 / ISO 9001:2008 certified. Various processes and procedures have been put into place to ensure our bolted steel tanks meet customer expectations and delivery schedule. In addition, STCI has earned the reputation of providing exceptional customer service and ensuring our customers are happy with their new epoxy coated bolted tank. The results of these extra efforts are illustrated in our excellent Customer Satisfaction rating and customer testimonials. When all of these factors are considered, it is evident what makes our tanks, “Superior”. Water storage tanks for fire protection has improved in recent years as technology has advanced, processes have evolved and standards have become more rigorous resulting in increased flexibility, greater durability and lower costs. 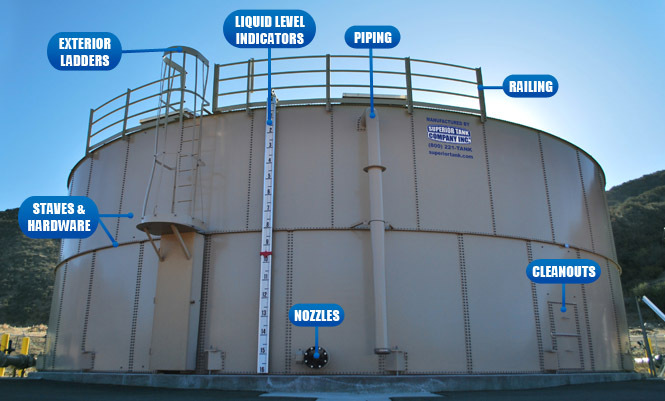 Modern ground storage tanks used for fire protection are commonly one of three designs; bolted steel tanks, welded steel tanks and concrete tanks. Concrete tanks are commonly used for projects requiring greater than 80,000 gallons of water storage due to the high set up cost of the required equipment on the job site. This expense makes smaller concrete tanks cost prohibitive relative to other designs. Welded steel tanks for fire protection provide a wider range of capacities anywhere between 25,000 to 3,500,000 gallons. In addition, welded steel tanks are available in a variety of configurations including reservoir style storage tanks and standpipe water tanks. 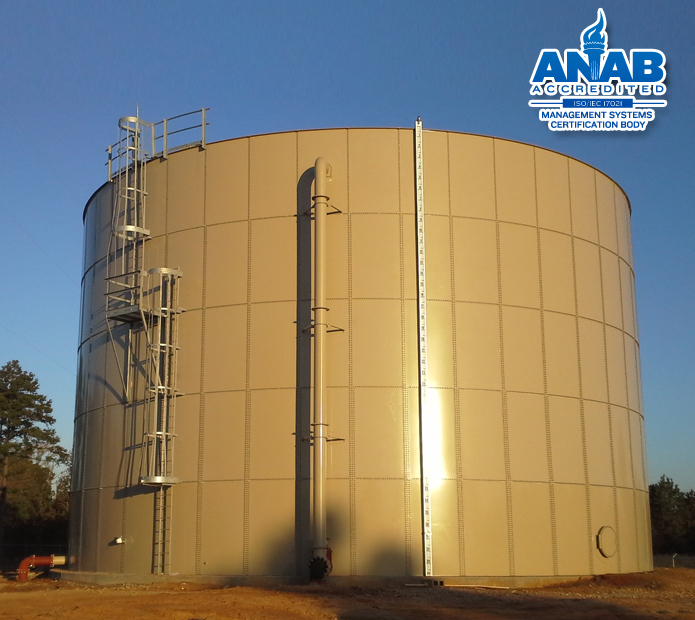 For certain applications, customers prefer the smooth exterior of a welded steel storage tank. We Don’t Crack Under Pressure! In the bolted steel tank industry, two coating options are common; factory powder coating and glass-fused-to-steel coating. Each of the coatings has its own unique properties and characteristics when applied to bolted tanks and steel tanks for water storage. Bolted tanks with a glass-fused-to-steel coating are attractive to potential buyers as the coating is non-porous and very rigid. The glass is applied directly to the steel then heated to 1500˚F to melt the glass and bond the glass to the steel. In theory, the glass coating isolates the steel from the liquids stored in the bolted tank. Unfortunately, the real world can be very different from theory. Ironically, the same properties which make the glass coating attractive for use with water storage tanks also make the coating vulnerable to cracking. The rigidity of the coating does not allow the glass to flex with the steel tank panels which expand and contract with temperature changes. This difference in expansion rates can lead to the coating cracking under stress. In addition, the extreme rigidity of the glass coating can help to resist very minor impacts but can lead to cracking if impacted with any significant force. When the coating on a glass-lined bolted tank cracks, the steel underneath is exposed and corrosion will likely occur. After the corrosion starts to spread, it can result in undercutting and the overall failure of the coating. As the glass coating is applied to the steel at the factory and melted at a very high temperature, it is not possible to fully repair a bolted tank with a glass-fused-to-steel coating. The only “fix” possible is to cover the cracked area with mastic. The proper way to ensure the panel does not experience corrosion and coating failure is to replace the entire damaged panel as glass-lining cannot be fixed or repaired in the field. The vulnerability of a glass-lined tank to impact makes it critical to protect the storage tank panels during shipping and installation as well as after the ground storage tank is installed. A dropped tool or thrown rock can result in an expensive repair and require the storage tank to be taken out of service to replace an entire panel. With winter weather coming, it is important to prepare your steel water storage tanks. Winter weather and colder temperatures will impact your steel storage tanks, no matter how severe the weather is. Some bolted steel tank companies’ warranty lasts only as long as you can see the taillights on their trucks as they leave the job site. We take great pride in the quality of our bolted tanks and the skill of our tank installation teams. 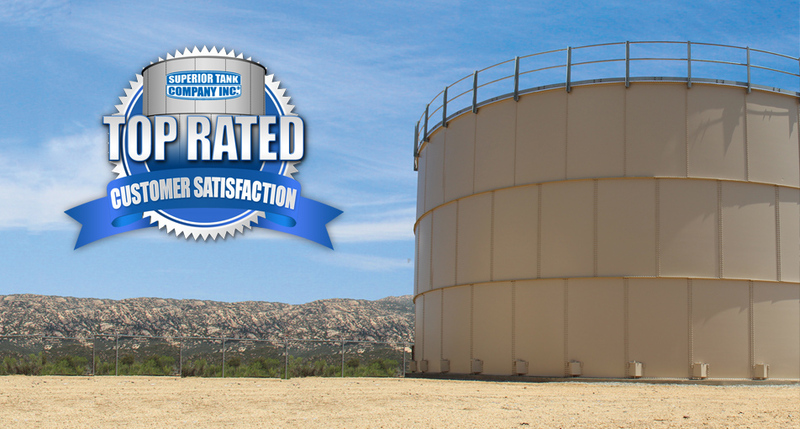 Superior Tank Co., Inc. backs all of its bolted tanks with one of the best warranties in the ground storage tank industry. Over the last 30 years, Superior Tank has earned an outstanding reputation for customer service and our warranty coverage. We are known for doing business the right way and taking care of our customers. We send out our people to resolve any issues with your steel tank. Our warranty does not require you to uninstall the part, ship the part back then wait for us to decide what to do next. Nor will we ever prorate the value of the part and send you a check and expect that will resolve the problem. We understand the high cost of having your storage tank out of service or the extensive amount of damage a defective oil or water storage tank can cause. We design, manufacture and install all of our ground storage tanks NOT to have problems in the first place! Our API SPEC Q1/ISO 9001:2008 certification is evident of our commitment to quality. Every year, we sell hundreds of parts for bolted tanks and welded steel tanks. Even though many ground storage tanks needing parts were not originally manufactured by Superior Tank Co., Inc., we can provide standard replacement components for steel storage tanks or can fabricate custom parts and accessories to fit. While these seem to be the fundamental oil and water storage tank components, we have found many ground tanks in the field require one of more of these items. For example, it is not unusual for welded steel tanks to experience bottom corrosion and subsequent steel loss as the underside cannot be coated. In addition, select hot dipped galvanized bolted tanks which are over 30 years old can experience bottom corrosion and require new components. Our fabrication department will custom manufacture replacement steel tank bottom sections to any size or dimensions to fit either bolted tanks or welded steel tanks. Most bolted tank companies use the term “designed to” when referring to industry and quality standards. At Superior Tank Co., Inc. we can positively confirm all of our bolted steel tanks meet or exceed the expected design and quality objectives. Superior Tank has undergone the very rigorous API SPEC Q1 and ISO 9001:2008 certification process which reviews the various elements of bolted steel tank manufacturing including tank order, engineering, production, delivery, installation and service. During the certification, countless processes were audited to ensure policies and procedures were in place to guarantee our steel tanks comply with set standards, meet or exceed customer expectations and are delivered within the prescribed timeframe. For example, the external ISO audit team reviewed our procedure to exactly transfer all bolted steel tank specifications from the approved Sales Order to our Engineering Department for design. Our Engineering Department maintains an extensive electronic central library of steel tanks and steel tank components which have been verified to industry standards and exact specifications. 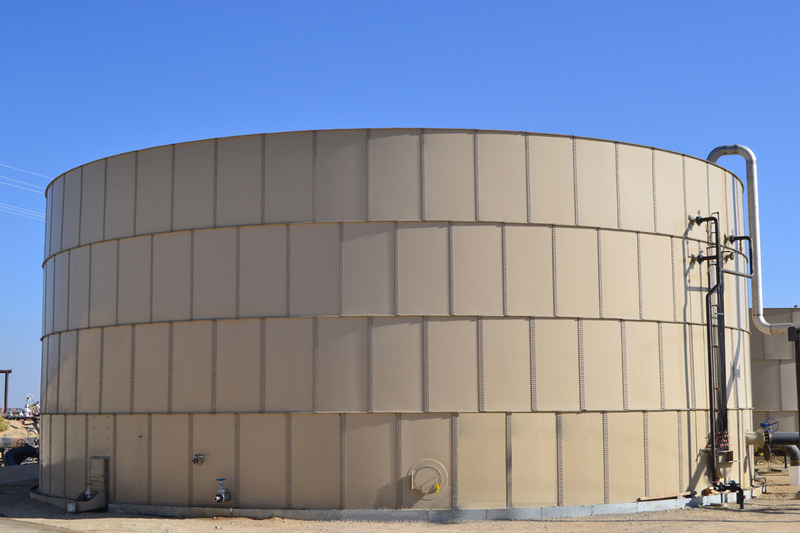 Starting with solid and consistent design elements ensures our bolted steel tanks will meet engineering performance standards. Raw materials such as steel used for staves is verified to meet specific quality standards. For example, surface quality, edge quality, silicone content, squaredness and flatness are checked and materials not meeting standards are rejected. Inferior and low quality materials are never used. Another element of the certification process is making sure our ground storage tanks are manufactured to precise tolerances using the latest CNC and robotic welding machinery. Quality inspectors are located at key stages to ensure finished parts meet various established specifications. Any non-conforming parts are discovered during manufacturing stage and are rejected. At the completion of the production cycle, the various steel tank components are final inspected by a designated quality control auditor and the complete inventory of parts is compared to original production checklist for accuracy. In addition to being certified under the API SPEC Q1 and ISO 9001:2008 process, critical aspects of our tanks have been tested by an independent laboratory. Our factory powder coating has been stress tested for various characteristics including resistance to abrasion, significant impact, salt spray, high humidity, temperature and corrosive chemicals. In separate testing, our Silica -Zirconium (SiZr) underseal was verified to prove its ability to prevent corrosion and coating undercutting if the powder coating is damaged by a thrown rock or dropped tool. In all areas of testing, our powder coated bolted steel tanks meet or exceed performance standards for durability. We understand we could save money by eliminating our strict quality standards but we have witnessed competitor’s tanks fail due to inferior materials and processes and we are unwilling to compromise quality. When purchasing your next bolted steel tank, look for companies which have been API SPEC Q1 / ISO 9001:2008 certified to ensure you are actually receiving what you ordered. 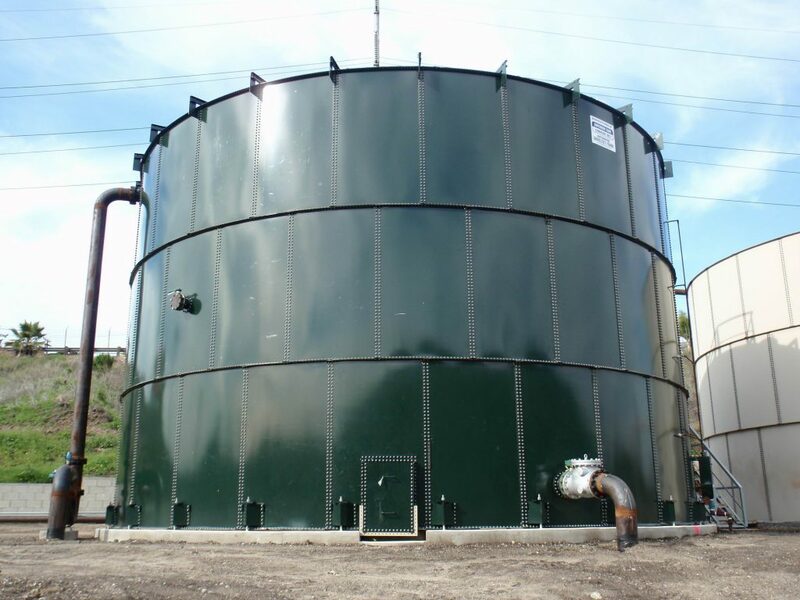 At Superior Tank, we can confidently state that all of our bolted steel tanks meet or exceed design and performance expectations. We do not simply try to “design to”; we succeed! In recent years, glass lined bolted steel tanks have become more frequent despite the higher initial cost. The arguments for a glass lined tank are simple: glass coating is non-porous and very rigid. Therefore, the theory is that liquids cannot reach the steel and cause corrosion, which could destroy the tank. Unfortunately, there are a few details which impact performance of glass lined bolted steel tanks in real life. First, great care must be taken when shipping, unloading and installing steel staves to not crack the glass overlay as cracks will allow water and liquids to penetrate the enamel coating. A particular area of susceptibility is the edge of steel staves as the hard and brittle glass coating is vulnerable to impact. Even minor damage to the edge can result in a catastrophic failure of the enamel coating system. Once the glass lining has been compromised, the steel will begin to corrode under the glass coating, resulting in the coating delaminating. As the glass lining of the tank is fused to the steel at very high temperatures at the factory, this process cannot be replicated in the field. The only way to attempt to correct damage is by covering the area with mastic putty. Not only is this unattractive, but the putty mastic can peel off over time, re-exposing the damage underneath. Superior Tank Company., Inc (STCI) is one of the only manufacturers of bolted steel oil storage tanks which can feature the prestigious API SPEC 12B monogram. In order for the bolted steel tank to include the API 12B monogram, the tank must strictly adhere to the API SPEC 12B standards. In addition, the tank manufacturer must be certified to meet the stringent API SPEC Q1/ISO 9001:2008 quality standards. Our bolted steel tanks for oil storage are engineered to meet the strict API SPEC 12B design standard and include numerous elements to increase tank durability and longevity. To seal our tanks, STCI utilizes Buna-N or Viton gaskets in place of mastic putty which cannot be used for oil storage. The Buna-N and Viton gaskets are extremely durable and resistant to crude oil and other petrochemicals. In addition, the gaskets have a high tensile strength to prevent tearing and they remain flexible over time, thus eliminating leaks. For increased durability, we apply factory powder coating specifically formulated for oil storage. For continuous immersion service, epoxy factory powder coating or premium Scotchkote powder coating is applied to tank interiors. TGIC polyester powder coating is used on the exterior of our bolted steel tanks for greater UV resistance. API approved appurtenances such as specialized roof vents, gas outlets, liquid outlets and manways are used on all steel tanks for oil storage. Superior Tank Co., Inc. can also fabricate custom internal and external piping to meet customer requirements.